The angel said, "Do not be afraid, Zacharias, for your prayer is heard, and your wife shall have a son, whom you shall call John." ACHARIAS, THE PRIEST, was an old man. All his lifetime he had been in the priesthood, for he was a descendant of Aaron. And he had married a woman named Elizabeth who also belonged to the family of the priests. Zacharias and Elizabeth loved God and lived to please him as well as they knew how. They thought often of the promises God had given to the Jews by the old prophets who lived and died many years before their time. These promises were that some day God would send a Saviour into the world, a son of David, to rule over his people forever. But the angel said, "Do not be afraid, Zacharias, for your prayer is heard, and your wife shall have a son, whom you shall call John. This child shall bring you much joy, for he shall be great in the sight of the Lord. He shall never drink wine or strong drink, and he shall have God's Holy Spirit dwelling in him and giving him power such as Elijah had, to turn the people from their sins to serve God." 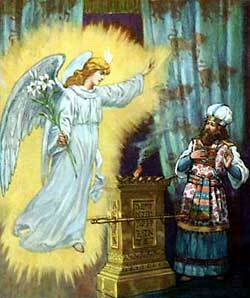 The angel answered, "I am Gabriel, the angel who stands in the presence of the Lord, and I have been sent by the Lord to tell you this glad news. But you have not believed my words, because you ask for a sign. Therefore this sign shall be given to you: You shall not be able to speak another word until the child is born."